Shot this from my kayaklastnight while paddleing around in the bay. style="BACKGROUND-COLOR: #000000"Edited in PS to my liking, levels, saturation, blur/soften. style="BACKGROUND-COLOR: #000000"Critique and or comments welcome. Wow! This is great photo.. I like this effect you have used to make it soft light. Great! Hi Mag! 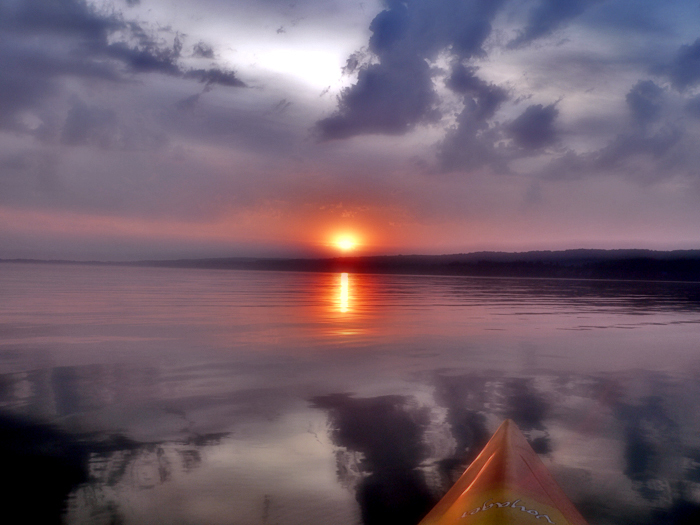 From one kayaker to another "Awesome shot"! Nice kayak Bob, lots of tie downs for lots of gear. I would like to find an island that I can paddle out to and camp out on. I think that would be alot of fun! Lovely shot Mag. The reflection and the front of the kayak really make it. Nice editing too. Cheers......thekman. Cool shot ... what camera/lens are you using? I have a friend who owns a kayak/canoe company and he's forever trying to get me into one, saying it'll be great for photos. I'm a bit leery of taking camera equipment into a canoe or kayak .... any tips or tricks?? Hey thekman, thank you very muchfor compliment and input! I used a Panasonic FZ20 with a UV and polarizer filter. Its lens is a Leica 36 -432 mm (35mm format) zoom with Image Stabilization. Im still learning but i try to use the fastest acceptibleshutter speed for the current conditions and i shoot in burst mode so hopefully i get 1reasonably sharpshot out of a burst of 3 or 4. I am still quite leary myself about taking pictures from my kayak, im sure plenty people think im nuts, but weres their sense of adventure? heh. Im quite impressed with the IS and love being able to get some decent photos from kayak. I made a custom case out of a 2 gallon gatorade blaze orange tupperware jug. I just stuffed some styrofoam in it to fit around my lens adapter.The lid screws on and its watertite andwill float with the camera inside. Thats great but it doesnt help me when im actually taking a picture, I try to stay in the shallows when i shoot. It also helps to pray to Mother Nature and the gods of equilibrium and balance!It is alot of fun but also a bit scary. I will probably get a waterproof casing someday but they sure are spendy. I would also like to find a nature preserve were i could paddle around and shoot waterfowl and other wildlife, maybe wear some camo and camoflage my kayak somehow in hopes of getting close. Thanks for the info Mag. I'm still trying to work up the courage to take to the water with my camera. I've also been looking at small duck boats, which will offer more stability than a canoe/kayak. Also, there are camo blinds available for the duck boats. Sure you can rig one for your kayak.